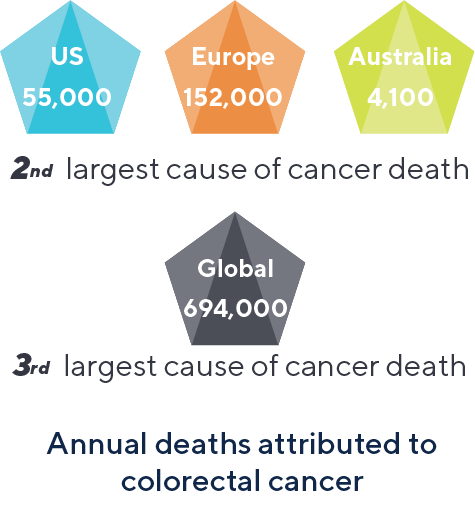 Colorectal cancer is currently the 2nd largest cause of cancer death in Australia, Europe (EU) and the United States (US), and the 3rd largest cause of cancer-related deaths globally. The seriousness of the colorectal cancer problem and benefits of early detection have been recognised. A number of countries around the world have introduced screening programs targeted at reducing the morbidity, mortality and healthcare costs associated with colorectal cancer. In Australia for example, the National Bowel Cancer Screening Program was developed to detect colorectal cancer early to enable early intervention, improve treatment outcomes and rein in associated health costs with treating the disease in its later stages. It’s estimated there are around 250 million people aged between 50 and 75 years for whom regular screening is recommended, yet the majority remain under-screened. Colorectal cancers arise in the epithelial cells that line the large bowel. The systems that normally control cell growth and survival have stopped working properly. These cells become cancerous after acquiring genetic changes that make them divide excessively and become long-lived. Colorectal cancers most often develop within precancerous overgrowths of epithelium called adenomas. Survival is highly dependent on how advanced the cancer is at time of diagnosis. At the earliest stage, cancerous lesions can be removed during a colonoscopy and survival rates can be 90% or even higher. Late stage treatment protocols become more invasive, are expensive and lengthy. Early detection and treatment of this disease increases treatment options and has the potential to save lives. Doctors currently use diagnostic tests such as colonoscopies and histological analysis of biopsy samples to detect the presence and determine the stage of the colorectal cancers and what kind of treatment is best. Patients with cancers at the earliest, most treatable stage of colorectal cancer, generally have no physical disease symptoms. These cancers bleed less, both in quantity and frequency, than more advanced cancers making them more difficult to detect with the most commonly used faecal screening test. The risk of the cancer spreading increases progressively by stage. 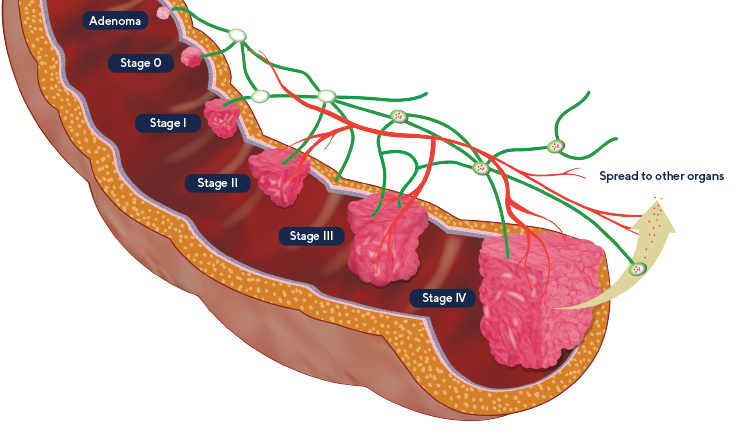 At each stage the cancer grows deeper into the layers of the bowel wall and beyond, increasing the risk of cancerous cells metastasizing. As the cancerous cells break away from the primary tumour they typically spread first to the lymph nodes, then to other target organs and tissues such as the liver, lungs, bones and brain. At these later stages, the primary cancer is easier to detect with current laboratory diagnostic tools. But, the patients will often require more invasive treatments which may also include chemotherapy. More effective detection of early-stage cancers and their timely treatment may save lives and reduce the invasiveness of treatment required. The Faecal Immunochemical Test (FIT) is an inexpensive pre-assessment of colorectal cancer risk. This test looks for surrogate markers of cancer (blood in the faeces) to identify whether a colonoscopy is needed for a clear diagnosis and to initiate appropriate treatment. This test is offered to people aged between 50 – 74 years in Australia and most of Europe. In the US, the recommended testing includes sigmoidoscopy and colonoscopy. Despite the efforts of screening programs to date, out of approximately 250 million people between 50-74 years of age in Australia, EU and US, around 132 million people are not screened as recommended for colorectal cancer.